Rev. 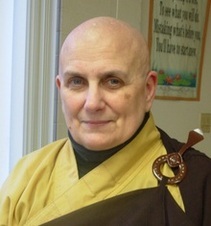 Heng Chih has been an ordained Buddhist nun in the Mahayana tradition for 44 years, and is one of the first five American disciples of Venerable Master Hsuan Hua. She is an experienced practitioner and teacher of Buddhism, including Sutras (Buddhist Texts), meditation and monastic precepts. Rev. Heng Chih is fluent in English and Mandarin Chinese, and has been credited in many Buddhist Text Translation Society (BTTS) publications of translated canonical Buddhist texts and their modern-language commentaries. Rev. Heng Chih provides formal lectures on Buddhism 3 evenings a week to anyone who wishes to learn, and facilitates meditation and discussion groups.